The Octonauts is definitely a series for those of you who like Japanese influenced artwork. It has already attracted a worldwide audience. The illustrations are colorful and super cute, and the stories are full of innocent fun. The design team who have created the series – Vicki Wong and Michael Murphy (A.K.A. 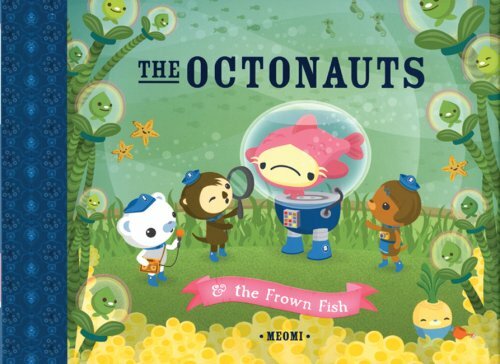 Meomi) – have just released their latest title, The Octonauts and the Frown Fish. The story begins on a “quiet and rainy” afternoon at the bottom of the ocean. The Octonauts are a team of undersea explorers. From their undersea “Octopod” base, they discover a fish with a frown so big that it is upsetting all of the other sea creatures around him. None of the Octonauts speak “Frownese”, so they decide to see if they can make him smile by sharing their favorite activities with him. I’d be smiling after a game of mini golf, baking, and making music, but not this fish, he looked even “frownier”. So, you may be wondering how they make him smile, well, it’s quite possible he has been smiling all day. See if you can figure it out – if not, check out the book, it’s really quite fun! A post by All About Kawaii: The Octonauts & the Frown Fish. Extra Fact: Meomi is the team that designed the 2010 mascots for the Vancouver winter Olympics.